Rovers have completed the signing of midfielder Stuart Anderson (26) on a one year deal, subject to international clearance. 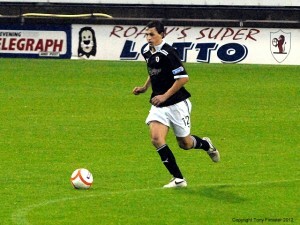 Stuart, who previously played for Peterhead, will be joining us from Salisbury City where he has spent the last season. Supporters attending our pre season friendly against Ross County on Tuesday evening will have had the first chance to see how Stuart will fit in, after he came on as a second half substitute (no 12) in our 1 – 1 draw with the SPL outfit. Stuart is Grant Murray’s first signing of his managerial career and we welcome him to Stark’s Park.